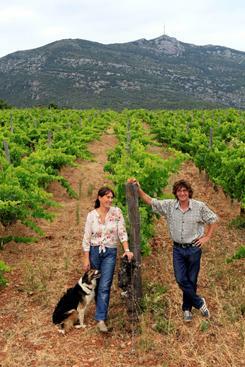 In 2005, after 10 years of searching, husband and wife team, Marie and Frédéric Chauffray came across the perfect plot of land--25 acres on the plateau of Arboras in Terrasses du Larzac, situated in the Langeudoc. They sold the prestigious wine shop they owned outside Paris and embarked upon the dream of making wine, together founding Domaine de La Réserve d'O, which has been farmed biodynamically from inception, the essence of their operation. Today, Marie is the president of the Terrasses du Larzac appellation and they are making some of the most exciting wines in the region. The wines are all certified organic and biodynamic by Ecocert and Demeter. Reserve d'O was given its name with a mission of establishing a nature reserve where wines can be produced in a healthy ecosystem that is abundant in flora and fauna. Wine Spectator 91"This focused, medium- bodied red has juicy acidity, with red berry, underbrush and mineral flavors, lined with licorice hints. The clean, lip-smacking finish shows nice overall balance."